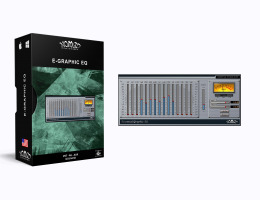 The Essential Graphic EQ is the perfect tool for sculpting the fine detail out of raw digital audio. 15 frequency bands, adjustable bandwidth and brick-wall limiter allow for precise control over each audio channel. For any type of project, this EQ lets each track stand out with its own sonic character. Macintosh Intel Core Solo 1.5GHz with 1Gb of RAM. Mac OS X 10.7 or above. Windows XP or above (32-bit and 64-bit). AAX, RTAS (Pro Tools) and VST plug-ins.